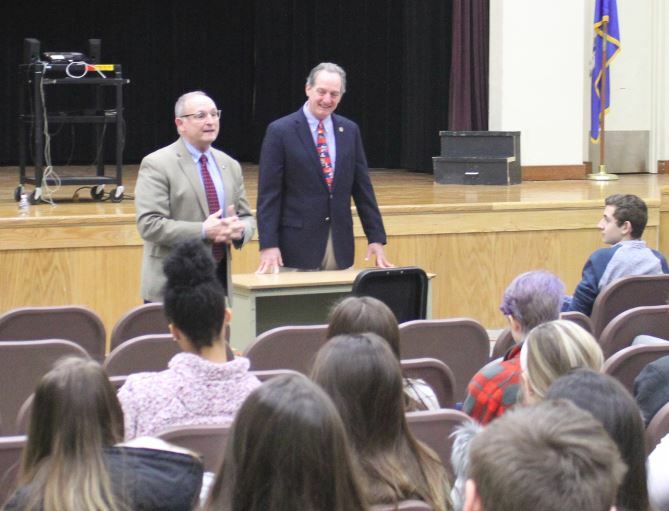 State Senator Henri Martin (R-31) and State Representative John Piscopo (R-76) visited Thomaston High School (THS) this morning to speak with local students about state government. All Seniors and Juniors from THS, along with one Freshman class, joined the legislators to start the school day discussing the legislative process, current issues being debated at the Capitol, and the roles that Sen. Martin and Rep. Piscopo perform in their respective Houses of the Legislature. Some of the specific issues they discussed included electronic tolling, legalization of recreational marijuana, legalizing sports betting, and a proposed tax on texting. Senator Martin and Rep. Piscopo extend a special thank you to Principal Perrucci and Mrs. Terri Franzi for organizing the discussion and providing time for students to learn something new. State Senator Henri Martin represents Connecticut’s 31st district including the towns of Bristol, Plainville, Plymouth, Thomaston and Harwinton. State Representative John Piscopo represents Connecticut’s 76th house district including the towns of Burlington, Harwinton, Thomaston and parts of Litchfield.